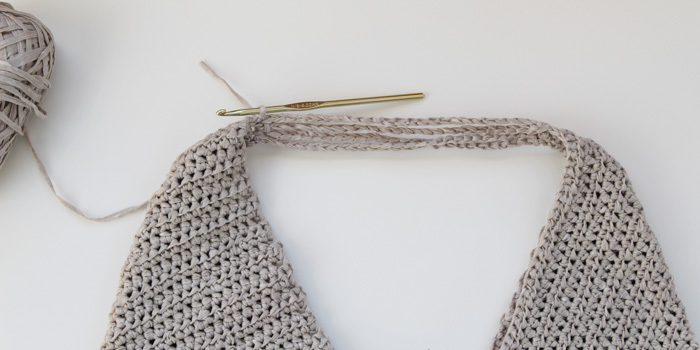 It’s hard to believe this beginner crochet tote bag is made from a simple rectangle! Basic crochet stitches and simple folds create a modern, multi-purpose bag. Get the full free pattern below or purchase the ad-free, printable PDF here! 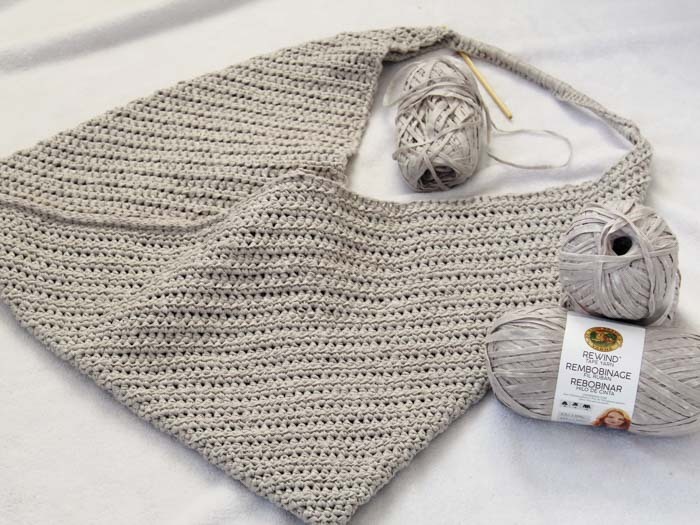 Thanks to Lion Brand Yarns for providing the yarn for this free beginner crochet tote bag pattern. This post contains affiliate links. Welcome to the Make & Do Crew guest designer series. 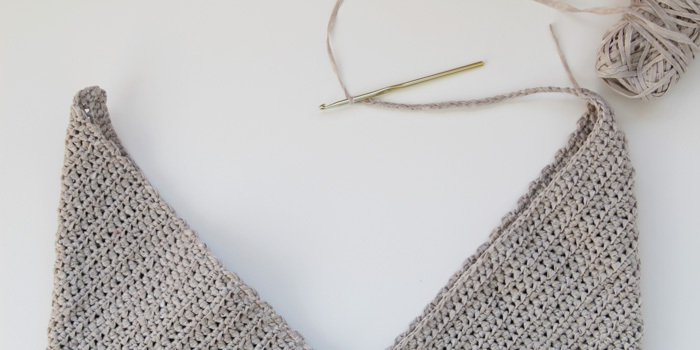 While I’m getting to know the newest baby in our family, Kimberley from Lakeside Loops is sharing her free beginner crochet tote bag pattern with us today! You can see lots of of Kimberley’s crochet patterns her blog, Lakeside Loops. And be sure to check her out on social media too: Instagram, Pinterest, and Facebook. Kimberley, take it away! Hi everyone! 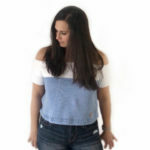 I’m Kimberley, the maker behind Lakeside Loops Crochet Patterns. Together, with my wonderful husband and our two sweet daughters, we live on a small lake on Canada’s East Coast. Many of my designs are inspired by our lake life and this Summer bag is no exception. Perfect as a tote for our local farmers’ market, bag for the beach, or simply as an everyday carry-all, this multi-purpose purse will be my go to accessory this Spring and Summer. 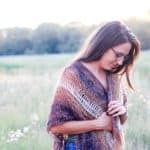 With a beginner-friendly design, this piece is great for those who are new to crochet or as a quick and easy project for the more experienced crocheter. Inspired by sewing projects for origami market bags, I wanted to design a crocheted version of for this Summer tote. 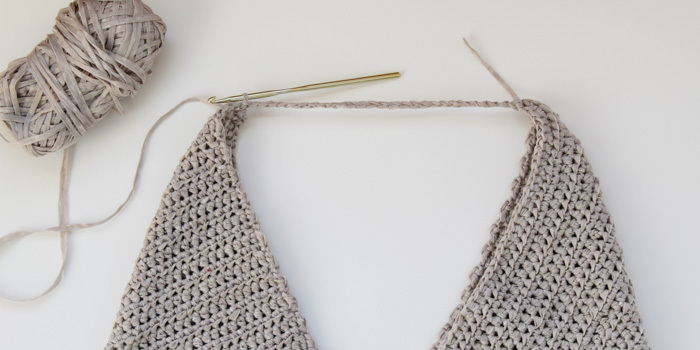 One basic stitch (the half double crochet) is worked in rows to create a simple rectangle. The rectangle is then folded in a unique way to create the roomy bag and then seamed together to hold the folds in place. I love this tote’s simple construction and clean lines. I think it’s neat that the diagonal seams are a feature instead of something to hide (as seams often are). The shoulder strap was created entirely with yarn and could be made longer if you wanted to make a cross body bag instead. I also think substituting leather or even fabric (maybe something with a coastal or floral pattern) for the strap would be a terrific touch. 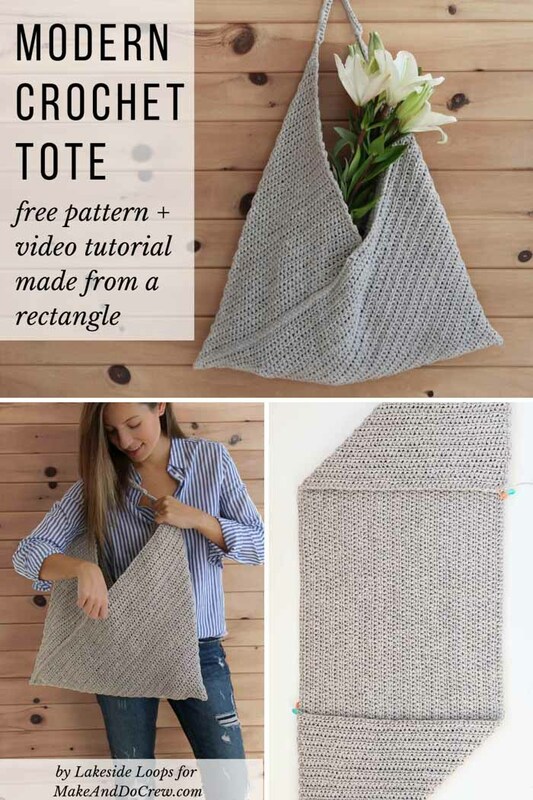 And if you’re a visual learner, you can watch a step-by-step video tutorial of this easy crochet tote bag pattern here. Rewind Yarn is soft, like reeeeally soft, so while the bag has that popular raffia look it’s actually quite plush and feels velvety against your skin. This tote would also look great worked in a cotton yarn if you’d prefer something with a little more weight and drape. Raffia yarn would also work well in keeping it lightweight, but with a little added texture. 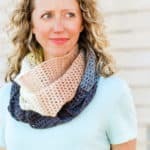 If you’re interested in more free beginner crochet patterns made from very simple shapes, here are a few of the most loved by M&DC crocheters. Save this to your Ravelry queue here. Watch a step-by-step video tutorial of this pattern here. Perfect as a tote for the market, bag for the beach, or simply as an everyday carry-all, this multi-purpose purse is sure to be your go to accessory this Spring and Summer. 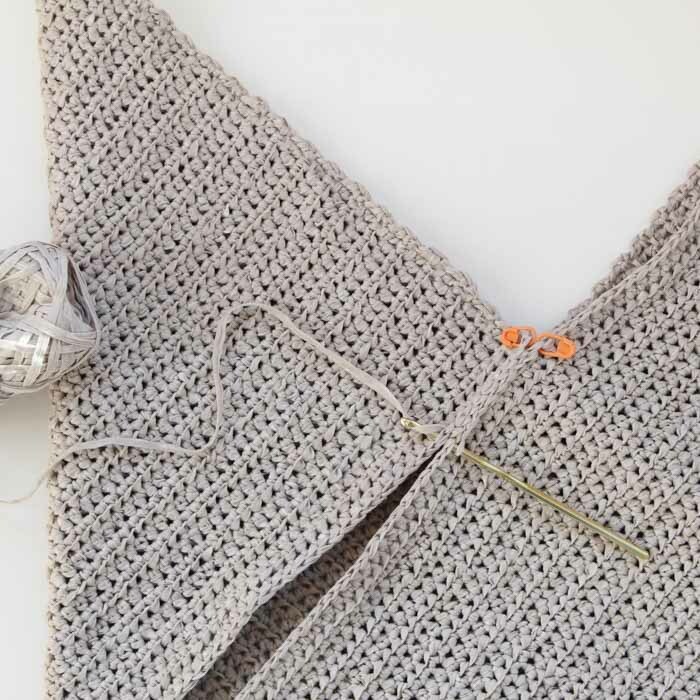 With a beginner-friendly design, this piece is great for those who are new to crochet or as a quick and simple project for the more experienced crocheter. Made with Lion Brand’s Rewind Tape Yarn, this bag is lightweight and has a raffia/grass look that makes it ideal for warmer weather. • Bag is a basic rectangle that is later folded and stitched together to form the finished shape. Handle is worked separately. • Ch-2 at beginning of row does not count as a stitch in stitch count. Fasten off. Try out your new Summer bag and make sure to tag @LakesideLoops and @MakeAndDoCrew in a pic! 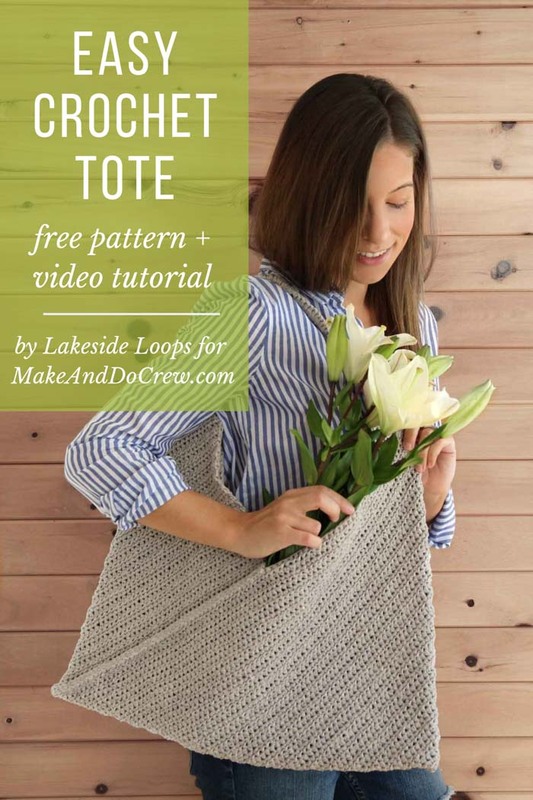 Thanks again to Kimberley of LakesideLoops.com for sharing this free beginner crochet tote bag pattern! Be sure to check out Kimberley’s blog for lots more free modern crochet patterns! 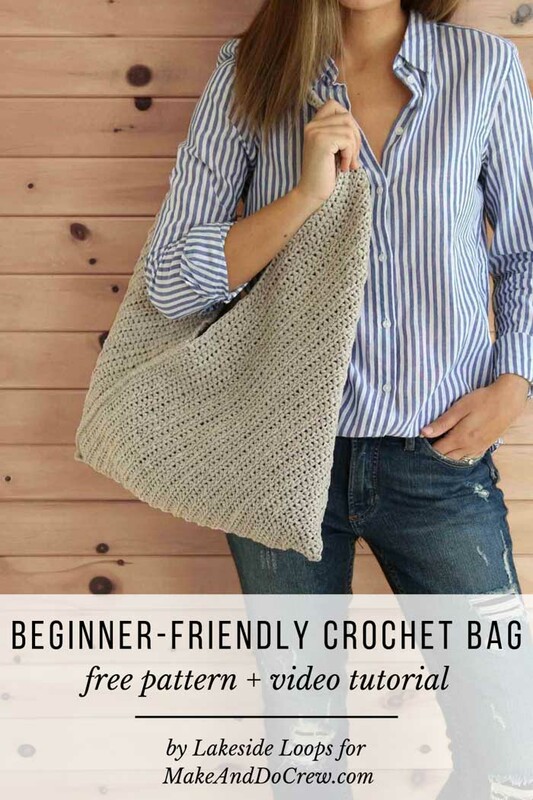 If you loved this beginner crochet tote bag, you might also like to check out these easy free crochet bag patterns. You can find all our free beginner crochet patterns here. 1. 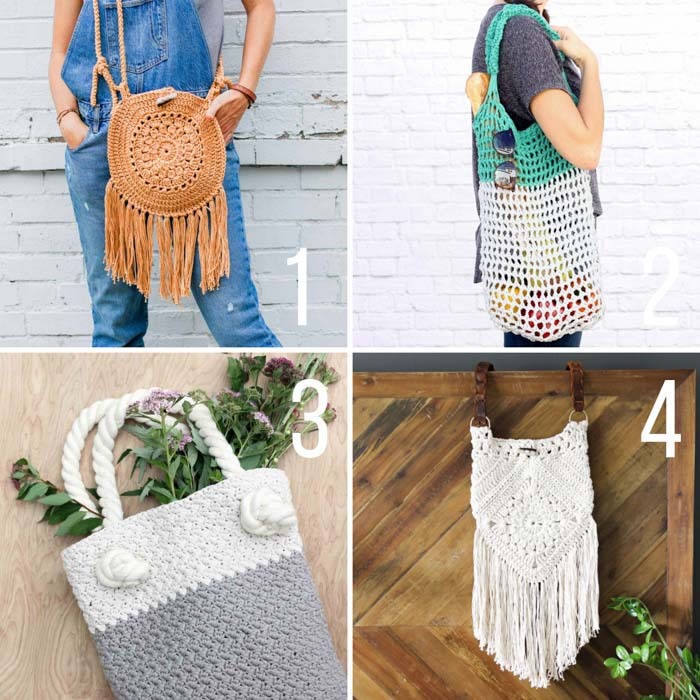 Street Fair Crochet Boho Purse – Channel your inner free spirit with this easy crochet boho purse made from two fun circles. Pair it with a sundress for a stylish summer outfit. 3. 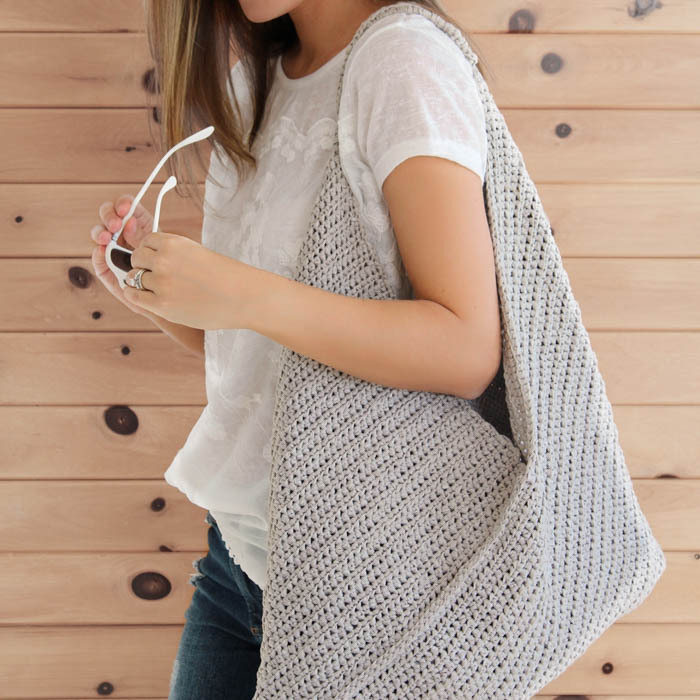 Suzette Crochet Bag + Video Tutorial – Neutral colors and a beautiful texture combine to form the perfect very beginner-friendly, modern crochet tote. (You’ll love the rope handle!) Includes video tutorial to learn the Suzette stitch. 4. 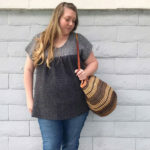 Urban Gypsy Boho Bag – The creative construction of this fringed bag is fun to put together and loaded with bohemian charm. 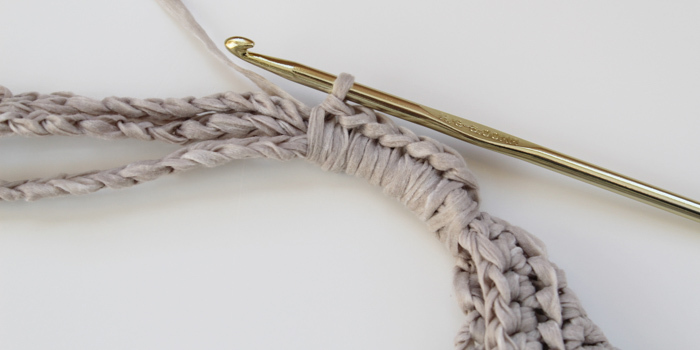 The free crochet pattern includes the options of a leather strap or a durable crocheted strap. I’m so happy to hear you’re enjoying the patterns here on the blog. Knowing that brings me so much joy! Absolutely love this design, I can’t wait to give it a go. Do you think this would look good made with wool yarn?? I think this style is really versatile, so you could probably use many different types of yarn and create a beautiful effect. 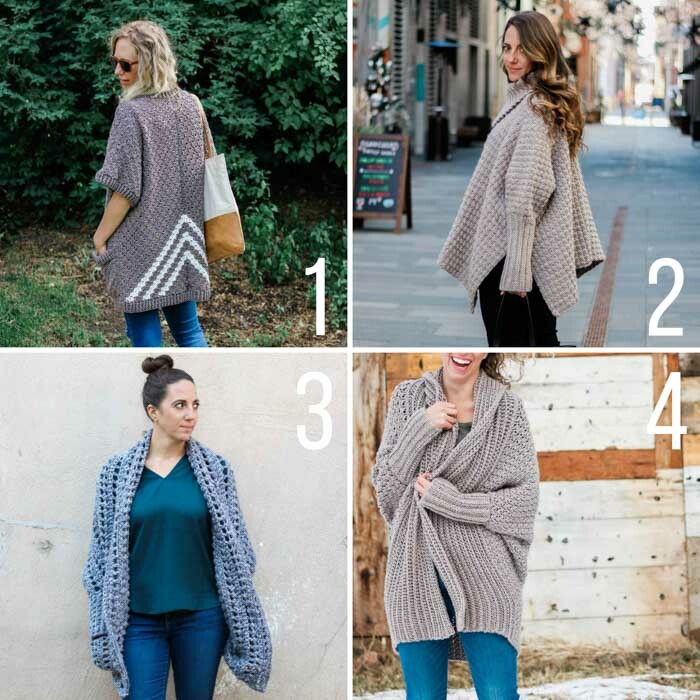 You can check out the rectangle dimensions in the pattern and meet those if you decide you want to change up the yarn and hook size.